Pavilonis’ long tresses were thin and prone to breakage before she had extensions put in. The condition wasn’t enough to keep her from going about her business but it was enough to make her somewhat miserable. For 20 of the 30 years she’s been operating a salon in Oak Lawn, Linda Leinweber has specialized in helping clients who suffer from hair loss. In that time, she has watched the industry evolve from slow, primitive methods that resulted in awkward wigs and hair pieces to fast, customized fits with materials that look and feel like real hair, and sometimes are real hair. Some clients, including Pavilonis, just need a little help in the hair department. Others request, and get, a complete do-over. “Hair loss doesn’t discriminate,” said Leinweber, who owns Shears to You Salon on Cicero Avenue. From something as common as menopause to a rare hair-pulling disorder known as trichotillomania, there are myriad reasons clients seek her help. Sometimes their condition is brought on by genetics, other times by stress or medication, particularly chemotherapy. Hair loss can affect people of all ages, from all walks of life, Leinweber said, but women seem to be most affected by it emotionally. “The majority of my clients are women between the ages of 30 and 60,” she said. Annette Kalat’s hair was super-short and super-thin when she went to see Leinweber. “You could see right through to my scalp,” the Homer Glen resident said. Kalat believes her condition is hereditary because other family members suffer from the same thing. 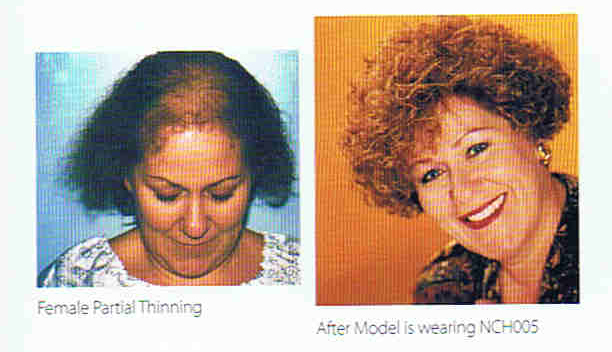 Leinweber made a mold of Kalat’s head and then fitted the 61-year-old with a hair appliance that is full and colored to her liking. Kalat can sleep and shower with the new hair, which is glued to her scalp. Not even her doctor who recently prescribed chemotherapy for her rheumatoid arthritis. 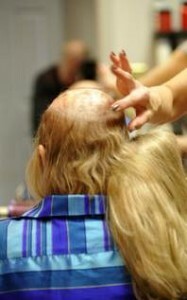 He warned her she might lose her hair during the treatment. Kalat revealed her secret — that she already had no hair — and her physician couldn’t believe it, she said. Even though hair loss is more common among men, some have a hard time accepting the condition. Steve Gianopolous, 59, said more than ever, society is driven by the desire to be or at least look young. “Appearance matters,” the Crestwood resident said. Gianopolous lived with male-pattern baldness until one day when he decided to practice what he preaches. A hairstylist who has worked for Leinweber for 16 years, Gianopolous recently let Leinweber fit his head for a hair appliance. “I had a comb-over. It looked ridiculous, and (Linda) straightened me out on that,” he said, chuckling. Today, his graying sideburns are topped with a full head of salt-and-pepper hair. Because he prefers to remove his new hair each night, his hairpiece is taped into place. “How can you make others feel better about their appearance when you don’t feel good about the way you look?” he said. Today, options range from hair appliances that can be cut, shaped, dyed and highlighted to the wearer’s liking. The client can also choose to have the piece glued securely in place, where it will stay through shampooing and sleeping, for up to six weeks, until his/her next appointment. Hair additions or appliances, as they’re now called, start at about $650 but can last up to a year and a half before they need to be refurbished. Regular visits with a stylist ensure the adhesive method stays fresh and intact. Most of Leinweber’s clients are adults, she said, but she did recently fit a 16-year-old who suffers from alopecia with a whole-head appliance. “Now he looks like he should look,” Leinweber said. “Hair loss makes you look hard, even if you’re young,” she said.